Starting on Saturday, June 3rd, I’m going to be doing a weekly twitch show called “Unfolding the Garden” where I play through old builds of Manifold Garden and discuss how the design evolved. The show will be every Saturday at 2pm EDT / 1pm CDT / 11 am PDT / 19:00 UTC. Each episode will be about 90 minutes. I’ll be going through the builds in chronological order, and talk about what I was thinking at the time. 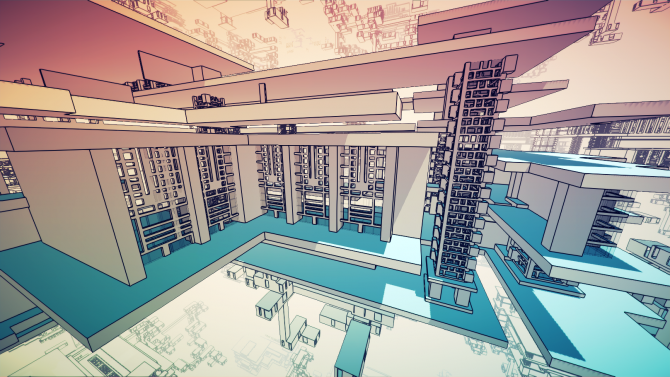 If you’re interested in the design process of Manifold Garden, be sure to check this out! Development update video #6 is now up! It summarizes the last 10 months or so of development down to 5 minutes. The last one of these videos I did was back in June 2016, then development got really busy and I stopped. 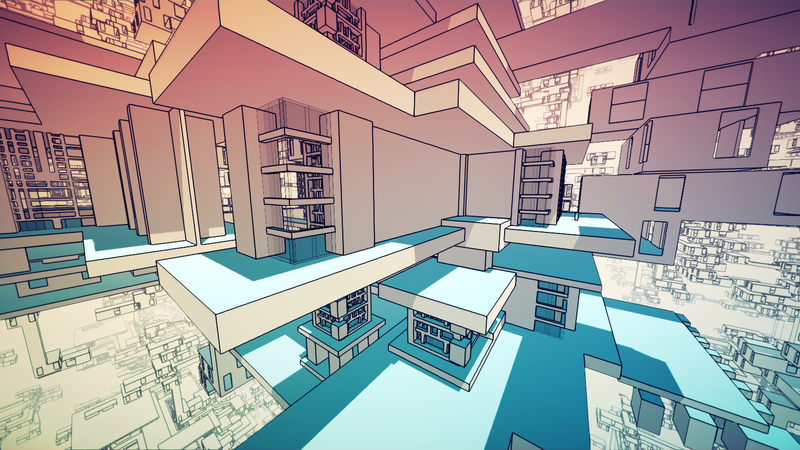 Now that the architecture of the game is more or less set, I’d like to produce these on a biweekly basis. Made some improvements to the world-within-a-world effect. The key part now is that gameplay objects (such as the door, button, and boxes) are enlarged when you shrink down. Previously, it was just the environment. This makes the transition look much smoother. It is also based on time instead of frame rate. Finally, the duplicate instances when the final level is grown are moved inward instead of popping in. Technically, this doesn’t make any sense, since you are shrinking down into the world, so the duplicate instances should grow outward. However, this looks fine and the effect lasts 2 seconds, so I’m going with it! It could of course use some more polish, and I do plan on coming back to it later. However, it’s pretty good so far! This isn’t quite what I want, but it’s a good start for now. I’m mostly posting it here as a reference to compare against later. 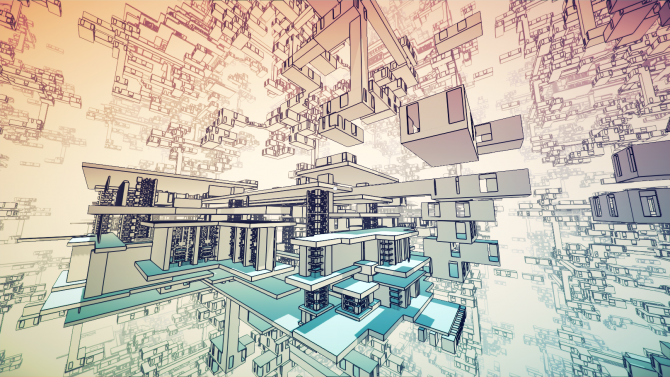 Title screen in Manifold Garden now changes based on player progress throughout the game. Wanted this feature for years. Finally added it. The code is still super messy, and I’ll probably want to clean it up soon before it gets to be unmanageable. 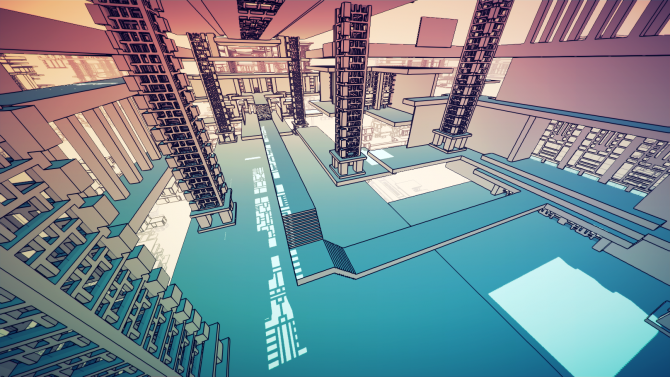 The hardest part here is making the title screens scenes as they don’t use the usual scene optimization process, so there’s a lot of manual work involved. Lots of progress done on saving / loading system. This stuff takes way longer than you’d expect. So much effort for these tiny details, but they really do contribute to the overall impression.